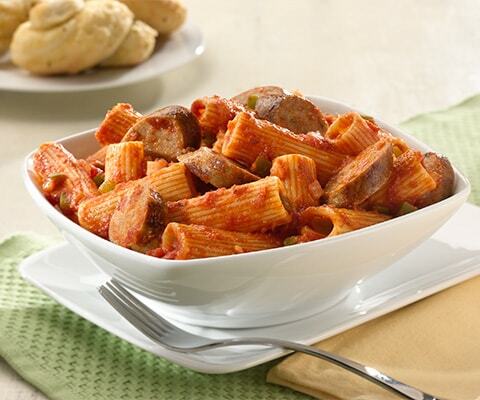 This easy to prepare favorite can be served family style for those large gatherings. Add dinner rolls and a tossed salad for a complete meal. Meanwhile, in a large skillet over medium high heat, brown sausage for 4 to 6 minutes, stirring until small crumbles form. Drain fat if needed. Add onion and pepper, and cook for 4 to 5 minutes, or until tender, stirring occasionally. Stir in Pasta Sauce and bring to a boil. Cover, reduce heat to medium low and simmer for about 10 minutes, or until heated through, stirring occasionally. Sprinkle Parmesan cheese on top and serve hot with cooked pasta. If desired, substitute Classico Four Cheese Pasta Sauce with Classico Tomato & Basil Pasta Sauce.